This week we are trying something a little different! T has created his very first vlog for you ;) he got a little camera shy and needed more prompting that I'd hoped but I don't think he did too bad for his first time. 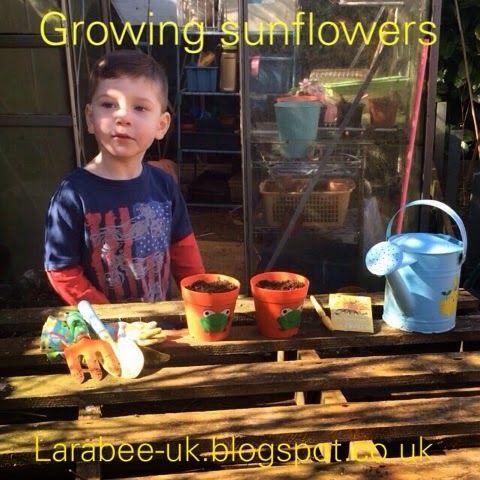 So over to T who's going to show you how he plants sunflower seeds (or sunflower 'fings'). This looks like a lot of fun! I don't know how well sunflowers grow in our hot Australian weather, but I'll have to find out! Aw he is so cute on the vlog talking through his sunflowers. I hope they grow big and and reward his efforts in the summer. Thank you for sharing on Country Kids. Thanks so much x I can't wait until we can get out in the garden regularly soon. He is so cute. Did you upload it directly? I have just done my first vlog and use imovie app on my iphone (it's £3.99 and made it all so easy). Aw bless - what a cutie!! Hope his sunflowers grown really tall!